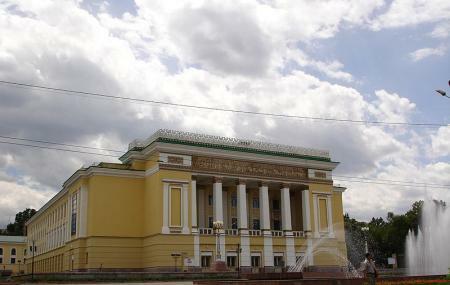 Abay Opera House is probably the first opera house in Almaty. Previously known as “Gatob”, it first came into being in 1933. Operation in its own theatre began in 1941, construction of which had started in 1936. It was renamed Abay Opera House in 1945, dedicated to the Kazakh poet, composer and philosopher AbayQunanbayuli. The House’s first director, the esteemed Yevgeny Brusilovsky, is responsible for eight national operas and a ballet. Including them, over forty international and Kazakh artworks have been performed here. An ideal Almaty trip includes top things to do in Almaty like Grand Aiser, Arbat, Korean Restaurant, Medeu and Bread House Georgian Restaurant. Personalize your visit to the city by chalking out a plan using Almaty trip planner. You won't miss your home when in Almaty, hotels in Almaty like Ambassador, Astra Hotel, Mildom Hotel and Resident Hotel Delux offer some of the best places to stay in the city. If you want to add the visit to Gatob (abay Opera House) in your trip, you can choose from the variety of Almaty vacation packages that can be designed to suit your preferences. These packages also cover your major concern of how to reach Almaty. Love this? Explore the entire list of places to visit in Almaty before you plan your trip. Fancy a good night's sleep after a tiring day? Check out where to stay in Almaty and book an accommodation of your choice. People normally club together A. Kasteev Art Museum and Baiken Mosque while planning their visit to Gatob. Professionally managed theater. Must watch a drama, Opera or ballet here at least once. I watched Silfida ballet. Excellent production at an amazingly humble price! This is an absolute must if you like a bit of opera, ballet or classical! Absolutely delightful ballet . Well organised and the atmosphere was magical.